Discussion in 'Other Toys/Hobbies' started by ShadowBurger, Jan 16, 2019. I have boiled linseed oil here which I used to finish the top of my coffee table and given how durable it has been I've thought about doing my workbench with it. The workbench sees quite a lot of practical use and has been stained with engine oil, grease, etc, because I just left it raw when it was built. I thought it would be nice to sand it back and finish it with something to resist it from getting into the wood. Thoughts? slap abit of ply on top, once that's buggered replace it. Recently watched a good youtube workbench build where he finished it off with Diggers Pale boiled linseed oil. looked great. Old blokes finish their outdoor tools handles with boiled linseed. Personally I got the thinnest mild steel sheet I could and put that on top of mine. Redwood might come up a bid darker, but yeh, should come up great. TBH that workbench is a bit overbuilt. I quite like yours, even more now I know its redwood. Absolutely oil the workbench. scrape any dried crap like glue or paint drops etc, give it a good sanding, couple of grits at least to rip the top layers and smooth the result, top and sides. Go slow and thoroughly with the linseed and leave it to soak etc as directed so you dont risk it oil staining other works later. down the track scuffs and cuts etc just need a small amount of oil on a rag worked in to restore the look unless you want to resand you'll never have to. in your specific case I'd turn the whole thing upside down and do the legs and top underside first, just for perfections sake plus it'll give you practise to make sure you do it correctly. yep, ply makes a good workbench surface, ideally have a good solid bench and use a cheap board on top of that as the actual worksurface. No need getting worried about ruining a good benchtop. So nice benchtop with maybe a built up "frame" or holes to secure another cheap flat worksurface on top that can be removed/replaced at any time. it also lets you get creative with your work area if you need like having a variety of tops with jig mounts or templates on them for projects you intend to repeat, a nice top surface to draw and write on paper on for planning, an absorbant particle board surface for when painting, a black/whiteboard surface if you are needing to write a lot quickly, a measured grid surface if you need an area to layout unconnected parts, a craft cutting surface, a glass top (just because...glass) you can usually have space next to or behind a workbench to lean up your spare tops out of the way ready when you need them, dont forget a removeable top is double sided too. Its just a flexible way to work. 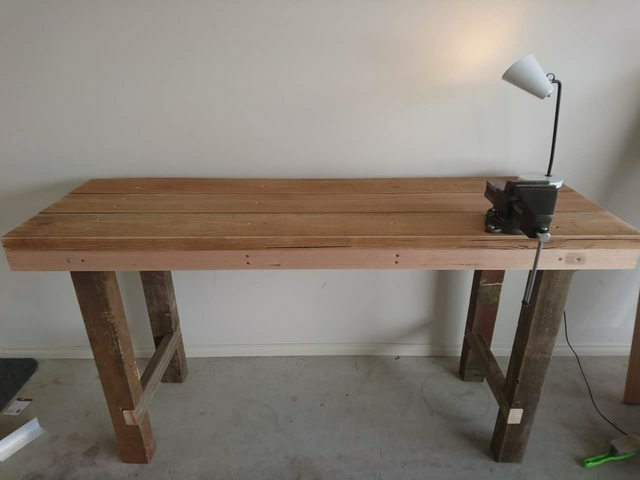 recycle centers are good to find sturdy tables/benches people throw away that make great garage workbenches.plus you can always bolt on one or two sturdy thick sheets on top to make a new larger workbench and use disposable sheets on top to work directly on. Yes, I have ply. Does the job nicely, and I cleaned up my shed the other weekend. Do we not have a general workshop/woodwork thread?